I completely forgot to post Evan's 18 month pictures. 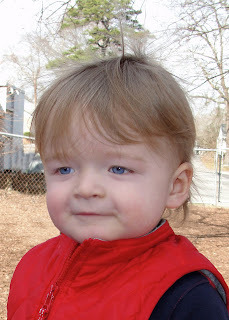 We took Evan to the park one day and I got lots of pictures. I decided not to take him to a studio since he doesn't stay in one place for very long and I didn't feel like chasing him all over. The park was much easier. I think the pictures came out pretty good! 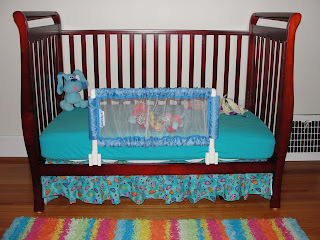 Yesterday we converted Evan's crib to a toddler bed. 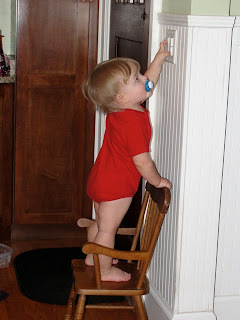 He climbed out of his crib a couple weeks ago and ever since has been trying to get out. Every night when I put him to bed, I would be glued to monitor just watching and waiting. 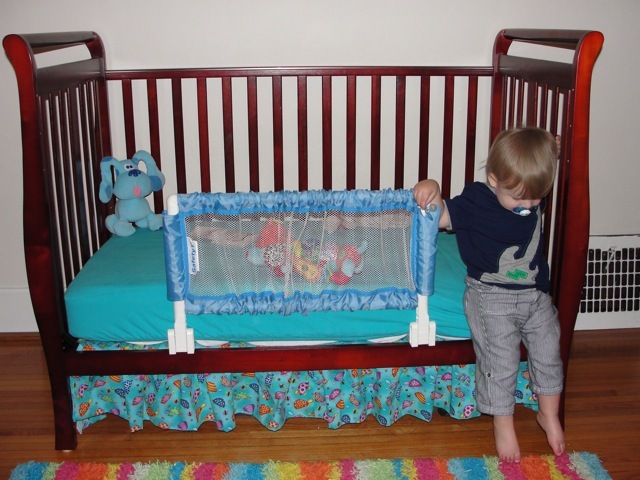 Sure enough, I had to sprint in there to prevent him from falling out of the crib. That was it for me! He was telling us that he was ready for a change. 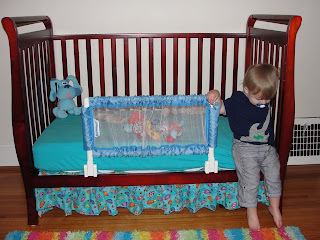 So, yesterday at nap time, he struggled a bit with enjoying the freedom to wander his room and wanting to go to sleep. After an hour of playing, he passed out on the floor. Before bedtime last night, we took out his toys hoping that would make it easier but he still wandered around. I eventually went in and put him back in his bed and told him that it was time to go to sleep. He was not happy. He cried for a few minutes and then got quite. He never got out again and went to sleep. Ahhhhhh. It was a lot easier than I expected. 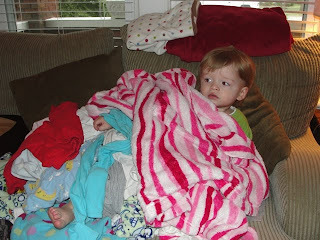 Today we weren't sure what was going to happen during nap time. He surprised us completely! He went into his room and climbed into bed. Minutes later he came out with a couple of his favorite bedtime toys and walked around. I assumed that that meant he was ready and he definitely was! I couldn't believe it! Eric went into his room with him and the two of them lied on the floor for a bit. 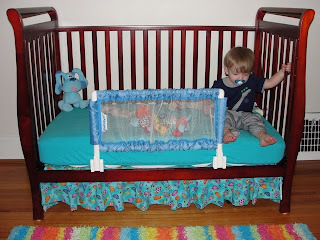 We put on his favorite music (moose songs from Nick Jr.) and put him to bed. He didn't try to get out and was asleep in no time! It was awesome! He is such a big boy! We are so proud of him! 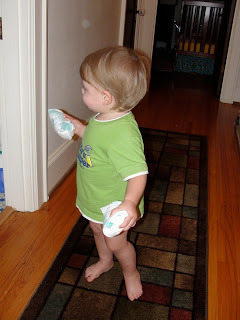 Evan will sometimes get dirty diapers from the bathroom trash and bring them to me. Yuck! I got a picture of him one time with one in each hand! 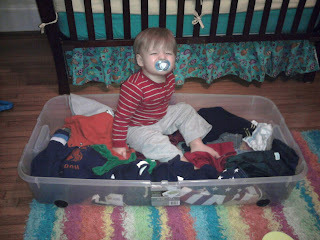 This is Evan helping me with the laundry. 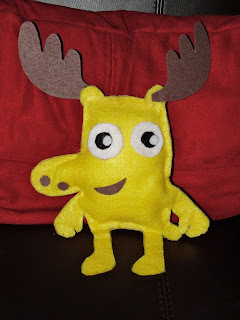 Evan's favorite character from Nick Jr. is Moose. Here's Evan signing moose. He doesn't quite get the "antlers" on his head. 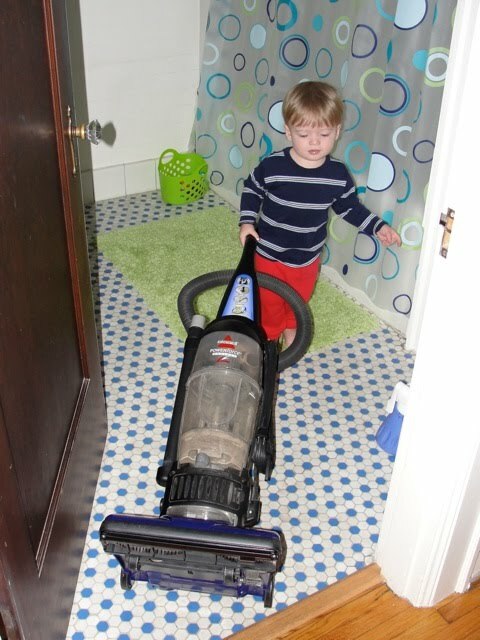 Evan absolutely hates the vacuum. The loud noise bothers him and every time I turn it on, he shakes and cries. 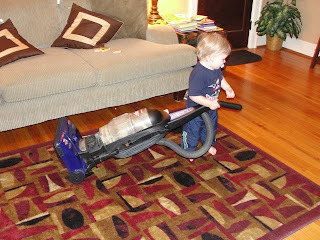 We put the vacuum in the living room so he could get used to seeing it and I was hoping it would help him get over his fear. It has sort of worked. 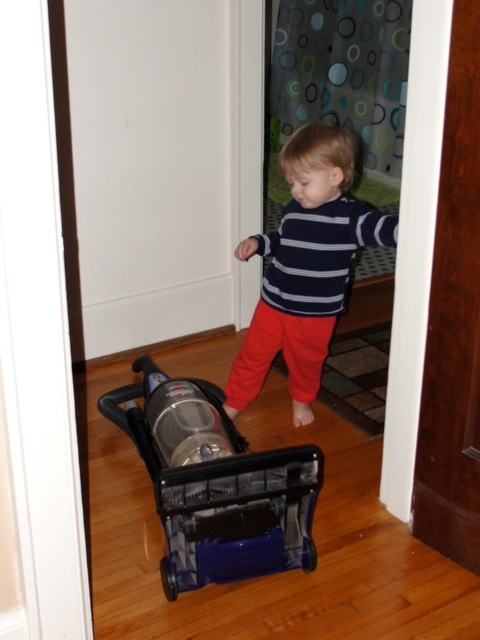 He waves at the vacuum and occasionally will try to push it around the room. It still frightens him when I turn it on but I think he's slowly adjusting to it. 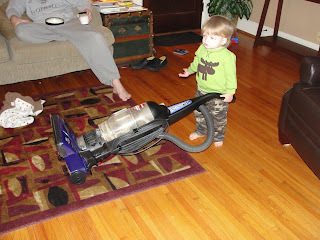 Here are some pictures of him with the vacuum. 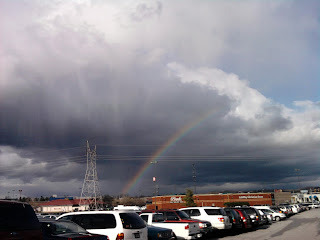 It's hard to see but there was a pretty rainbow at the mall today. Of course I didn't have my regular camera so I used my phone. Evan has added a few more signs to his vocabulary. He can sign please, book and moose. Moose is his favorite character from Nick Jr. and everything is about Moose. I just recently made a Moose pillow for Evan and he was thrilled! 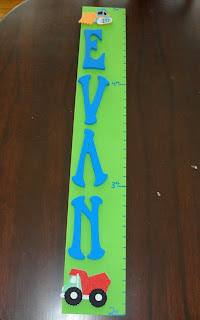 I also made a growth chart for Evan. I found directions online and put it together. It was easy and came out great! We haven't measured him since we haven't put it up yet! That's on the to-do list. 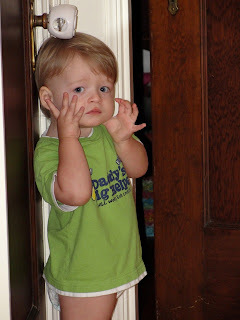 The other day, I was in the bathroom putting my make-up on and Evan was in the living room watching one of his shows. The bathroom is not far from the living room so I could hear what he was doing. I heard a noise that sounded like something fell from a very high place. I went in there thinking I would find him on the table again but I found him on one of the speakers next to the TV. The speakers are about 2ft high and he figured out a way to get up there. There are no pictures of him up there since I had to get him down right away. He's definitely a monkey and climbing is his thing. We have to keep our eye on him. We never know what he'll climb next! 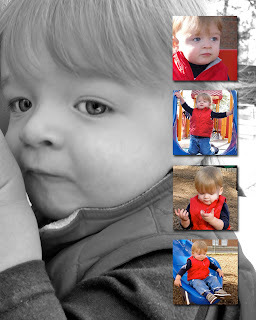 Here are some recent pics of our little monkey! 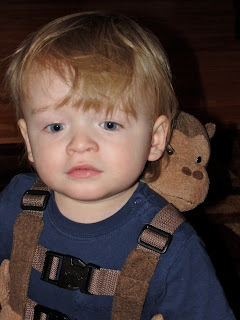 Speaking of monkey....I broke down and got a monkey leash for when we go out and Evan wants to run around. I always thought they were silly but now I know why parents use them! I will not judge again! Evan loves to turn the lights on and off. Evan loves getting in here. Every time I put it away, he got it out. Most of the time he just lies inside of it. What a nut!